With the almost unheralded imposition of NHSS 30 drawing ever closer, the powers that be decided to multiply the impending confusion by re-writing all the practical parts of the various BS7533 documents and draw them all into a single new document. So, just when you think you had a reasonable understanding of how paving should be laid and where to find the relevant information, it's all being rejigged. Now, this may not be a bad thing. There is a certain logic to compiling all the 'How To lay....' information into one location, not least because, as the installation of paving reaches a new level of professionalisation (albeit without skill recognition in the form of appropriate NVQs/SVQs and/or apprenticeships), much of the info once regarded as pertinent only to one type of paving, say, for example, sett laying, is now being used to lay flags. However, after too many years witnessing at first hand what can happen with the best-intentioned new guidance for paving installers when such guidance is prepared by those who don't actually lay paving for a living, I believe it is incredibly important that those who *do* earn their daily bread in the trade, those with a greater than 50:50 chance of laying a flagstone the right way up, really ought to have their say on how we do it. After all, it's the installers who have the actual experience; it's installers who know whether a proposed technique is practical or airy-fairy academic dreaming; it's installers who will know how any new proposal will impact on their ability to earn the aforesaid living. The proposed re-drafted document is now 'out for comment', which means it's being cursorily flicked through by a small number of selected people with limited direct interest in the contracting side of the business. Too many of those charged with reviewing the proposals are more interested in selling product, be it additional high-end paving or extra expensive bedding and jointing systems. What has not happened is a wholesale distribution to the hundreds of businesses who rely on paving installation to pay their mortgages. And don't be fooled into thinking that just because NHSS30 is intended for civil and commercial projects it's not relevant to you who bring home the bacon by installing patios and driveways. 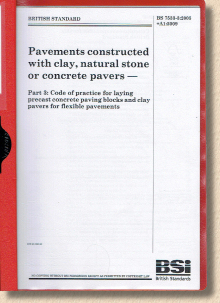 The new 7533 will become the de facto standard for ALL paving installation, so if you want to be sure your work complies, you need to be aware of it all. We, as contractors, can't start whingeing and moaning about changed methodologies or reduced earnings if we don't speak up now when given this albeit narrow window of opportunity to ensure any changes are very definitely for the better of the trade and the professionalisation of our businesses.